And the numbers are out! No, I’m not talking about Donald Trump’s falling popularity ratings after Friday’s GOP debate. Can’t really make pips off those, can we? Let’s take a closer look at the U.S. jobs figures for July to figure out what these imply for Fed policy and the dollar’s forex trends. 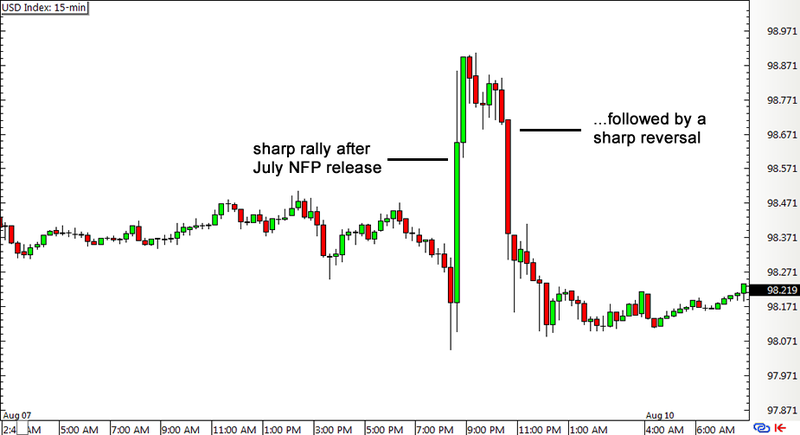 Why is the July NFP report a big deal? As a measure of job creation and a leading indicator of consumer confidence and spending, the non-farm payrolls report tends to generate a strong forex reaction from the U.S. dollar. Aside from usually spurring additional volatility and hundred-pip moves across major pairs during the actual release, the turnout also has a say in the dollar’s longer-term trends. What makes this July reading extra special is that the policymakers over at the U.S. central bank are on the lookout for “some” improvement that might be enough to convince them to hike interest rates sooner or later. In other words, strong employment data could increase the odds of monetary policy tightening taking place sooner (September) while weak jobs figures could suggest that the Fed liftoff would happen much later (December or early next year). How did the report turn out? The U.S. economy added 215K jobs in July, slightly weaker compared to the consensus of a 225K increase and the NFP readings for the past three months, while the jobless rate was unchanged at 5.3%. On a more positive note, the revisions in earlier reports amounted to a 14K gain, which was enough to keep the dollar’s spirits up. A closer look at the components of the report reveals that employment growth was seen across almost all sectors, with the retail and business professional services industries leading the pack. Full-time hiring also picked up while the participation rate, which indicates whether Americans are exiting or returning to the labor force, stayed neutral at 62.6%. Other labor market indicators showed an increase in the average number of hours worked, which suggests a slight bump up in the take-home pay of several employees. This allowed average hourly earnings to tick up by 0.2% as expected after staying flat in June. So are these numbers good or bad? Well, any form of jobs growth is generally good for an economy and the fact that the U.S. has been able to maintain an average employment gain of 235K for the past three months warrants additional brownie points. The Fed has even acknowledged that the labor situation continues to improve with solid job gains and declining unemployment, but whether or not the latest figures are good enough to seal the deal for a September rate hike is another question. At the very least, the July NFP results are enough to keep Fed tightening this year within the realm of possibility, according to some analysts. “Data illustrating the continued strengthening of the labor market have increased the likelihood of a first interest rate hike in September,” former PIMCO head Mohammed El-Erian wrote on his Facebook page. “If the Fed were to act only on the basis of job creation, the probability of a September rate hike would be dominant.” However, he added that several uncertainties remain, highlighting the “frustratingly slow” wage growth and the “fragility of the global economy” as potential factors that might convince Fed officials to wait a little longer. Based on the Greenback’s initial reaction to the report, forex traders seemed to be feeling torn as well. On one hand, the ongoing trend of employment growth has been relatively strong and underlying data has also reflected labor market stability. On the other hand, it’s still tough to say if the July figure was good enough to support a September rate hike. That’s probably why dollar bulls cheered after the numbers were printed then went home early to call it a night. There’s one more NFP report lined up before the September FOMC decision, which means that the August jobs data could set the tone for rate hike expectations and possibly the dollar’s forex behavior for the rest of the year. The Greenback might tread carefully in the coming weeks and be extra sensitive to leading indicators for employment so I suggest you keep close tabs on those reports as well!